We will be making Blocks, 39, 19, 56, 48, 7, 105, 90, 61. Templates for month 4 are, 1, 3, 4, 7, 8, 13, 19, 20, 21, 45, 52, 94. Before starting spray a light coating of starch on the wrong side of all the fabrics. Iron and cut as usual. This range of Flower Sugar fabrics are printed on a beautiful, fine base fabric, great for most sewing but not for small triangles. Use Templates 7, 8, 13, 20, 21 and 45. Template # 21 measures 1 15/16’’. If you place the fabric against the inside of the thicker 2 inch line, on your ruler this seems about right, most rulers only mark the 1/8’’. If you are worried about this cut a 2’’ square and trim using the template. Friendship. Using the White small roses, trace and cut 4 #45. Trace and cut 1 each of #7 and #8 from each of the 4 medium rose fabrics, 1 in Red, Yellow, Pink and Aqua. Arrange and sew together as per book. Checkerboard. Using the White small Rose fabric, cut 4 x 1 15/16’’squares for #21. 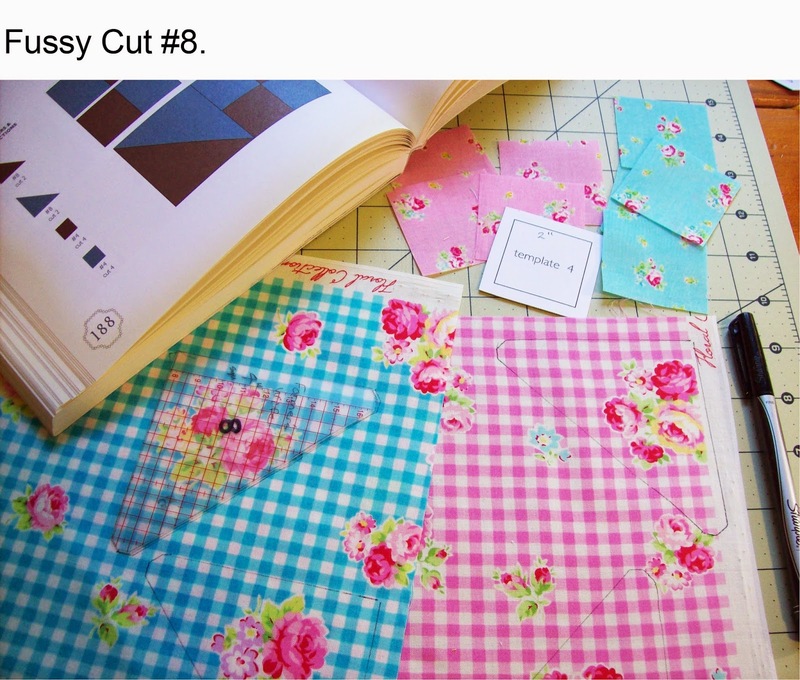 For rotary cutting, cut 2 x 1 15/16’’ squares and 4 x2 ¼’’ squares, cut these on the diagonal to give you 4 # 13 and 8 #20. 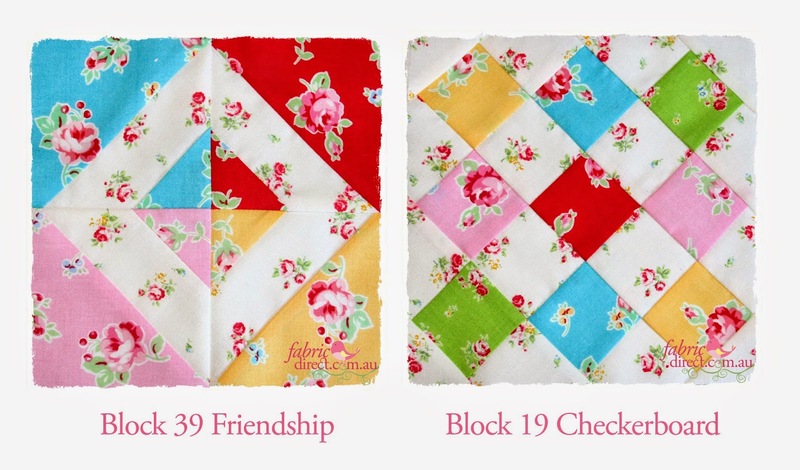 Cut 9 x 1 15/16’’squares, 1 in Red and 2 each in Pink, Yellow and Aqua in the Medium roses and then 2 in the Green small roses to give you 9 #21. Arrange and sew together as per book. Use templates 1, 3, 7, 19, and 52. Maple Leaf. From the Green small roses trace and cut 1 #52 and 1 x 2 ½’’ square for 1 #1. 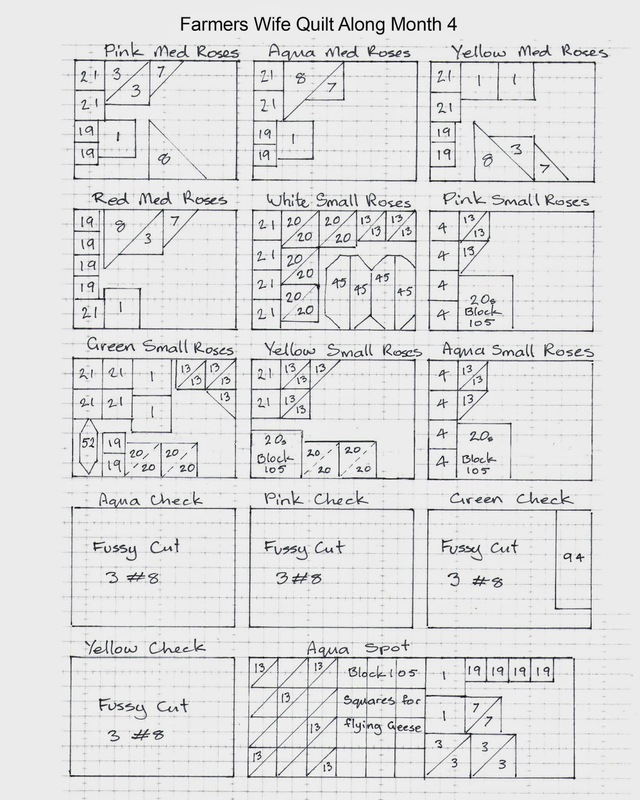 Cut 1 x 2 ½’’ square and 1 #3 each in Red and Yellow Medium roses then, cut 1 x 2 7/8’’ square in Pink medium roses and cut on the diagonal for 2 #3. 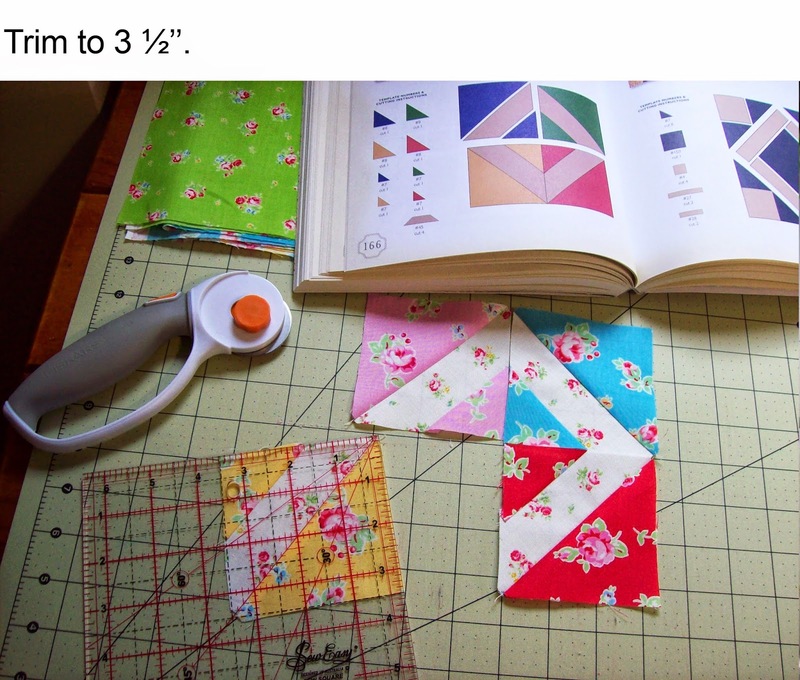 Using the Aqua Spot cut 1 x2 ½’’ square #1 and 2 x 2 7/8’’ and 1 x 2 3/8’’ squares, cut on the diagonal for 4 # 3 and 2 # 7. Arrange as per photo and book. Homeward Bound. 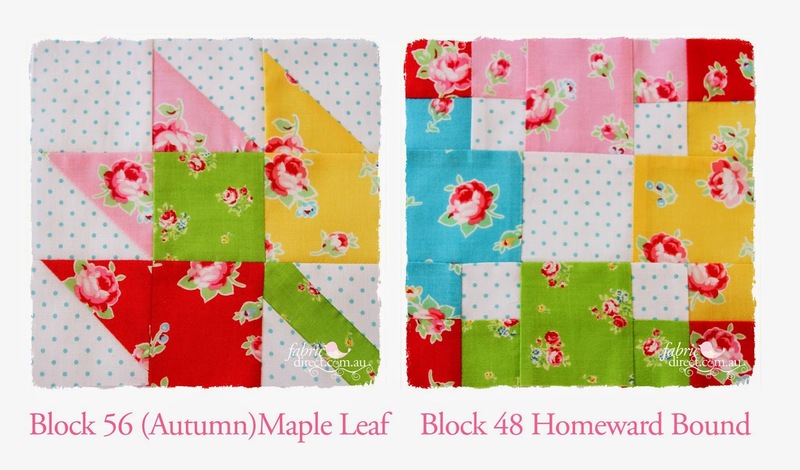 Using the Aqua Spot fabric cut 1 x 2 ½’’ square, #1 and 4 x 1 ½’’ squares for 4 # 19. Cut 1 x 2 ½’’ and 2 x 1 ½’’ squares each in Aqua, Pink and Yellow medium roses and Green small roses. Then cut 4 x 1 ½’’ squares in Red medium roses to give you 4 #1 and 12 #19. 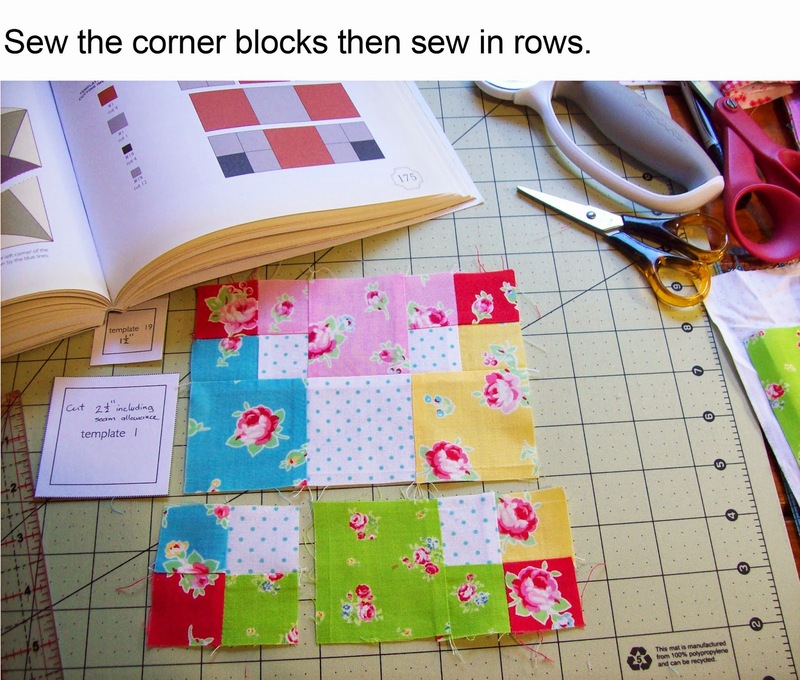 Arrange as per photo, sew corners into 2 ½’’ squares and sew together in rows. Use templates 8, 13, 20 and 94. Birds in the Air. Note that I have reversed the position of the light and dark fabrics in this block. 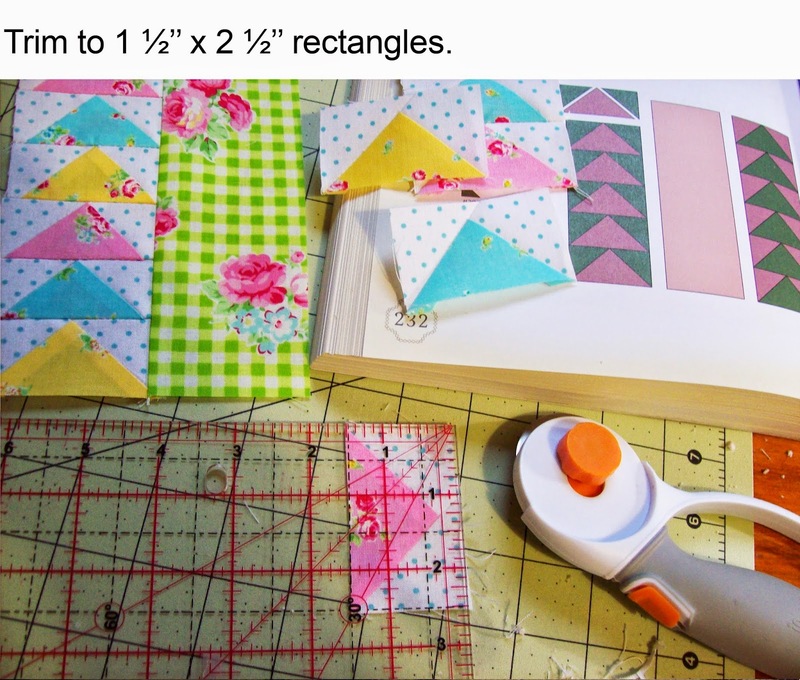 Using the Aqua spot cut 12 x 2’’ squares, cut on the diagonal and trim to give you 24 #13. Trace and cut 3 #13 each in Green, Pink, Yellow and Aqua small roses. 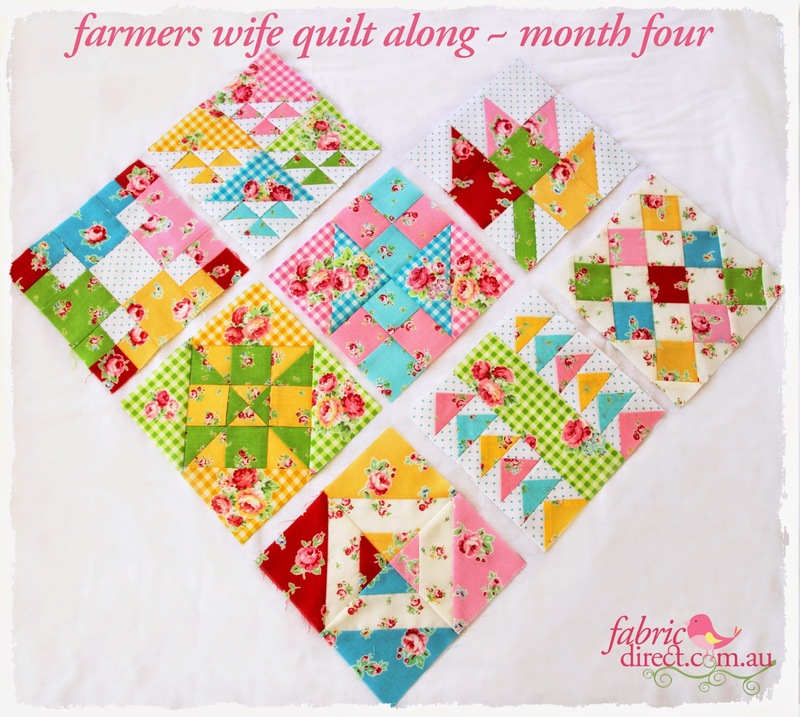 Note: I didn’t Fussy Cut my #8 for this block but they looked so pretty with the roses in the centre in week 16 that I suggest you do. 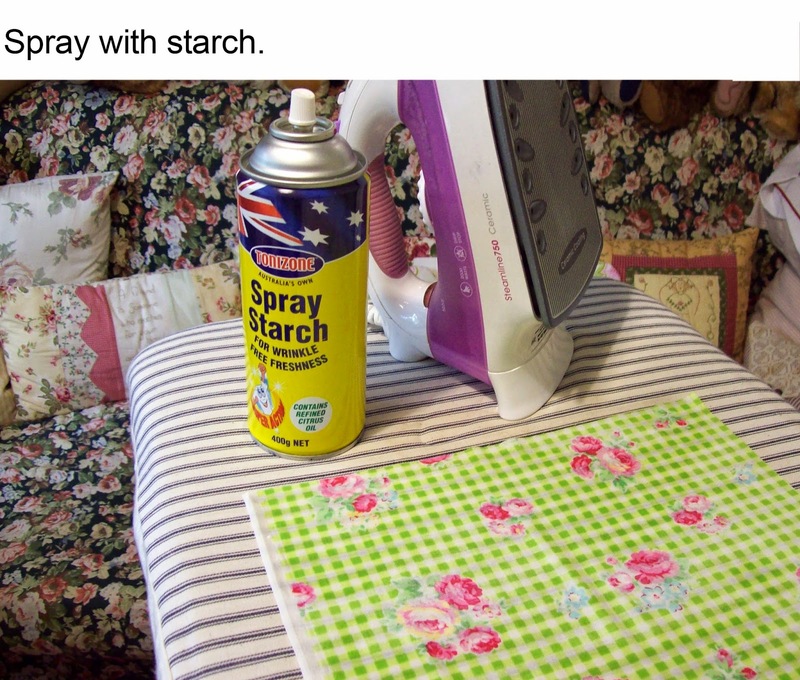 There is enough fabric to do so. Just check, the Green Check fabric, to ensure that you can still fit #94 BEFORE Fussy cutting the 3 #8. Trace and Fussy cut 3 #8 in Pink, Yellow, Green and Aqua Check roses. Save 2 of each colour for blocks 90 and 61. String piece the Aqua and coloured # 13s together, press and trim to 1 ½’’ squares. 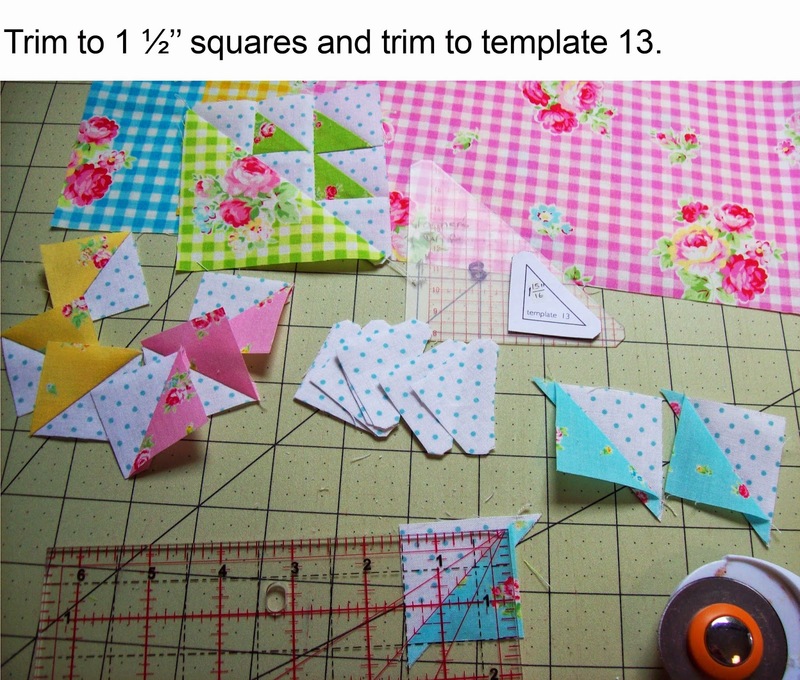 Arrange in place, sew together in rows adding the Aqua spot #13s to complete the triangle. 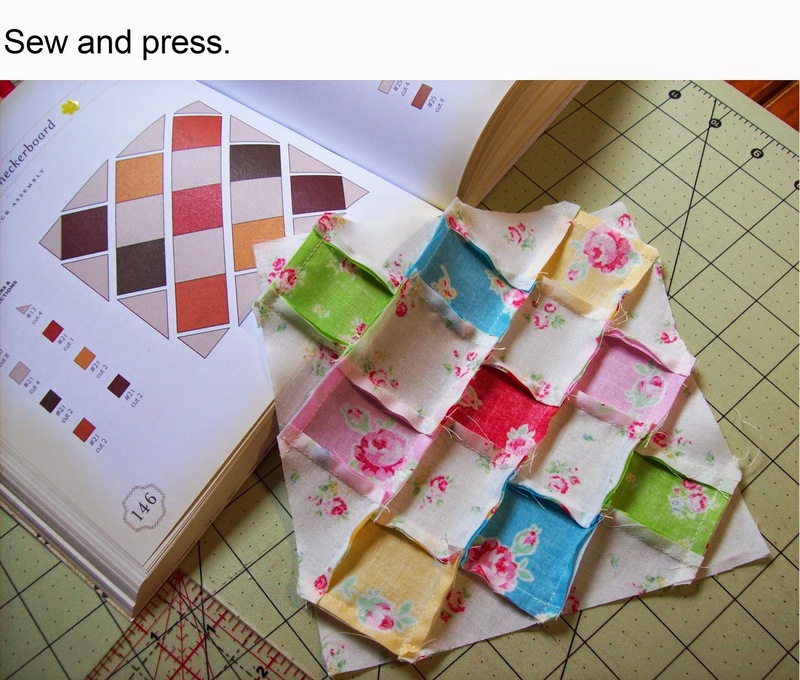 Sew together with the matching Check triangle, press and trim to 3 ½’’ squares and sew as per photo. Wild Goose Chase. 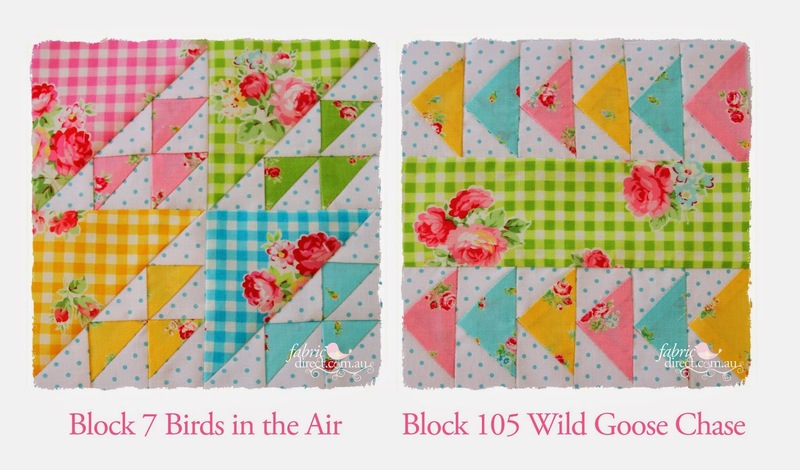 This is a quick and easy way to make Flying Geese Blocks. It makes 4 at once, as we need 12 that number is just right. Using the Aqua Spot cut 12 x 1 7/8’’ squares. Using a sharp pencil draw a diagonal line across the wrong side, or press a crease as per week 3. 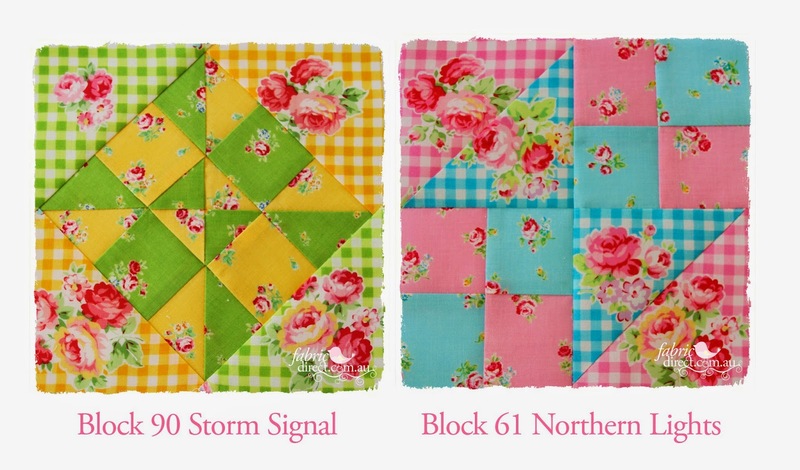 Then cut 1 x 3 ¼’’ square from each of the Pink, Yellow and Aqua Small rose fabric. Pin two Aqua squares, right sides together, to opposite corners of the bigger coloured square, overlapping the corners in the centre so that the line or crease runs from corner to corner. Stitch ¼’’ either side of this line and cut apart on the line. Press seam towards the coloured side. 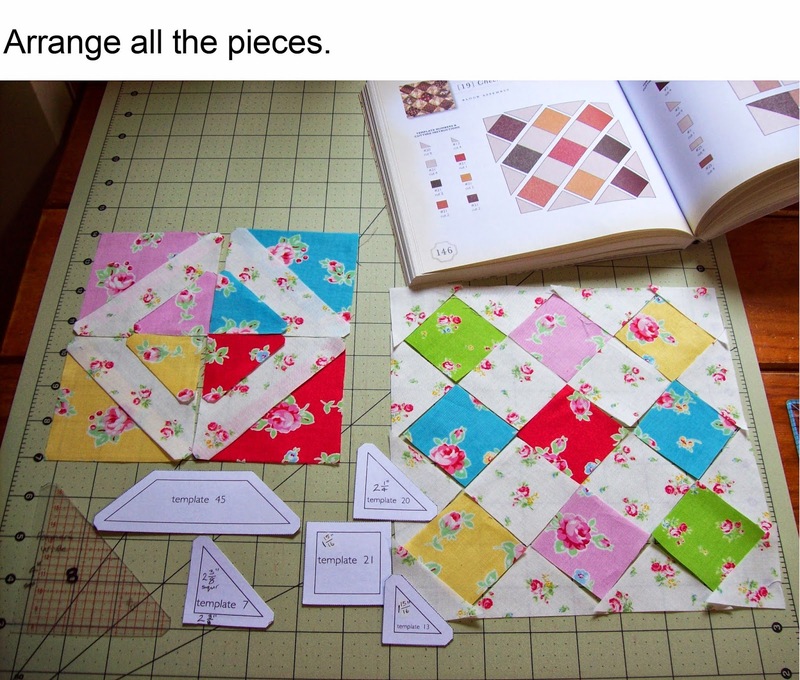 Pin two more squares as before to the remaining corners, sew cut and press as before, trim to 1 ½’’ x 2 ½’’ rectangle. Repeat with the other squares. Now you have your 12 Flying Geese. 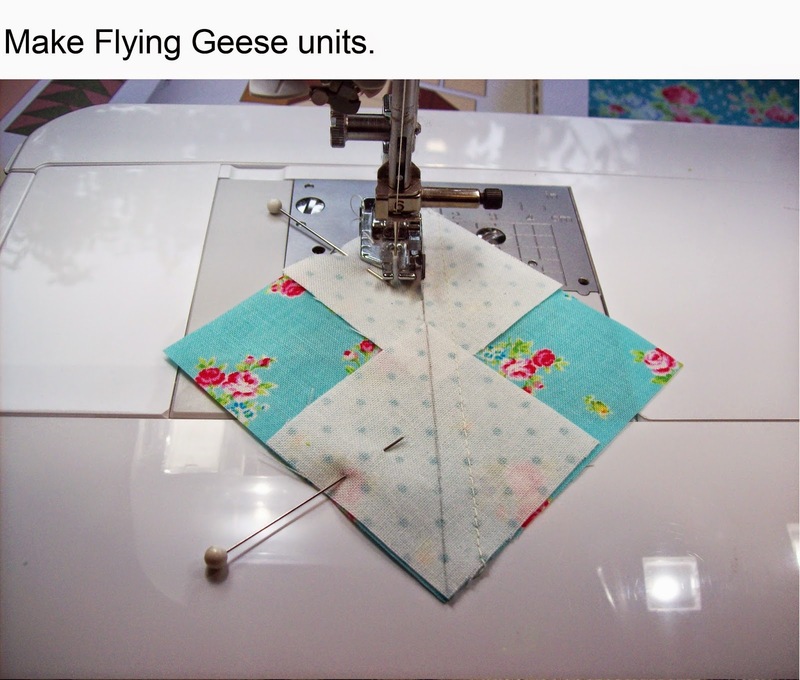 Arrange as in the photo and sew the Geese units together in two rows of six. Cut 1 # 94 in Green Check Roses and sew this between the Flying Geese. Use Templates 4, 8, 13, 20 and 21. Storm Signal. Start with your four Fussy Cut #8, two Yellow and two Green. 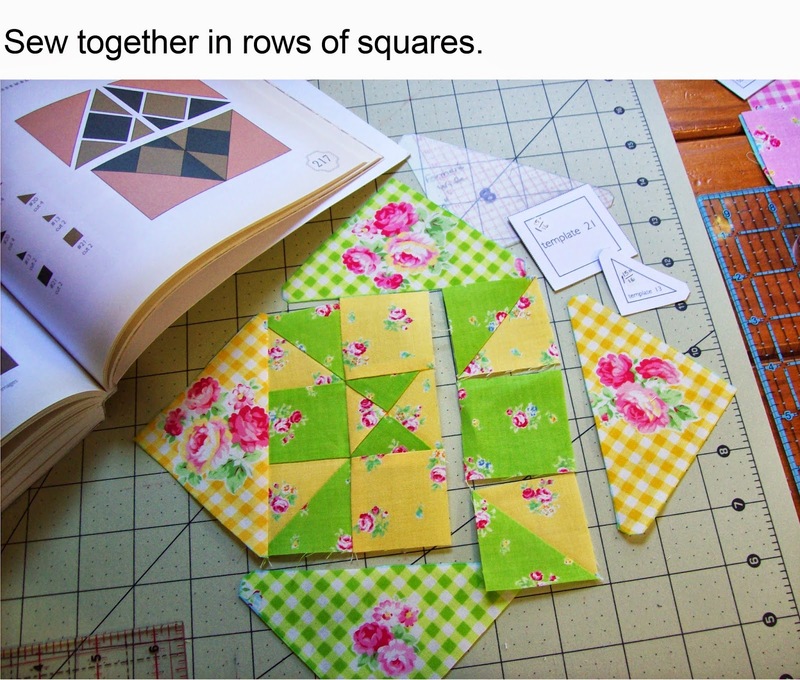 Using the Yellow small roses cut 3 x 1 15/16’’squares, cut 1 of these on the diagonal to give you 2 # 21 and 2 #13. 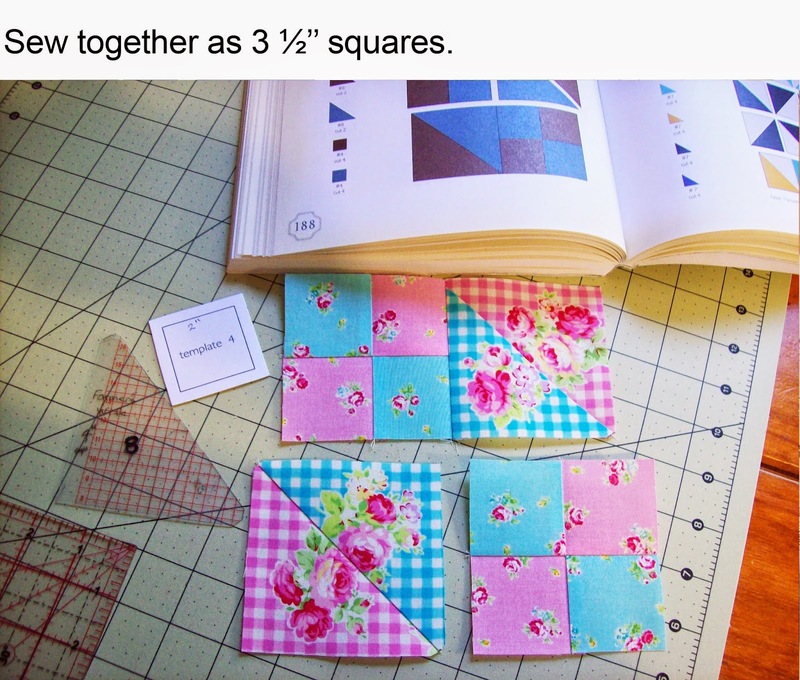 Then cut 2 x 2 ¼’’ squares. Repeat this with the Green small roses. 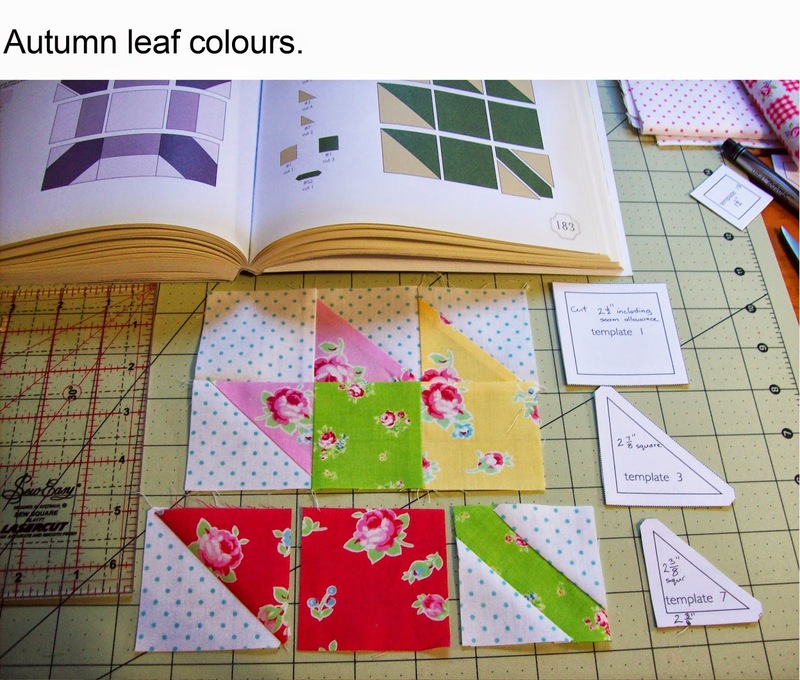 Using both coloured 2 ¼’’ squares make up 2 x ½ square triangles as per week 3. Make up centre square using the four #13. Sew together in rows then add the corner triangles. Northern Lights. Start with your 2 Aqua and 2 Pink check Fussy Cut #8s. Using the Pink small roses cut 4 x 2’’ squares. Repeat with the Aqua small roses, to give you 8 #4. Sew these in pairs and press towards the aqua. Pair up again into 4, sew and press. 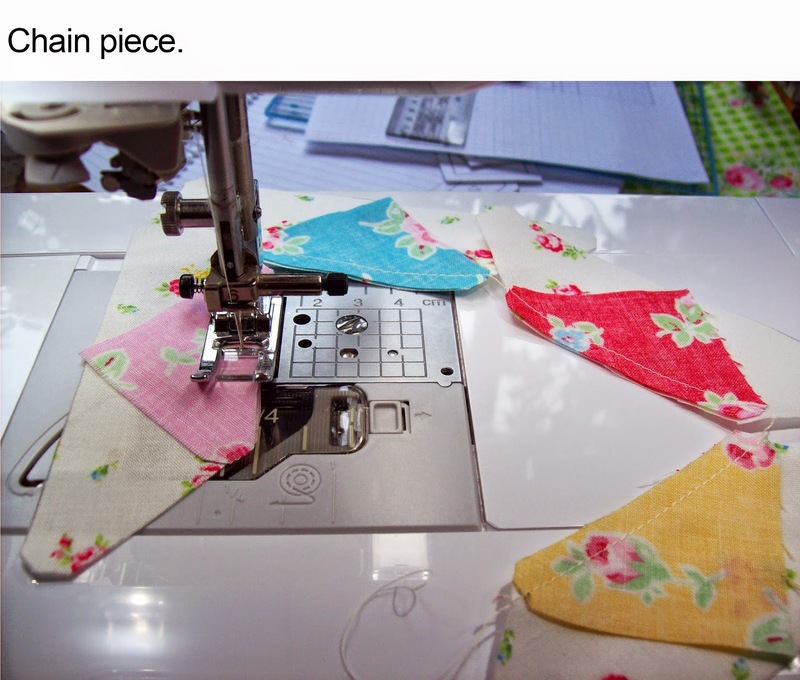 Sew the check triangles together, press and trim to 3 ½’’. Sew these together as per book and press. Wow that’s month 4 done. Aren’t they just so pretty! I hope you are enjoying these as much as we are!